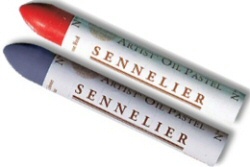 The pastels are made with top quality pigments, a non-drying synthetic binder and mineral wax. All of the pastels are lightfast, with the exception of the the metallic and fluroscent shades. Each pastel is 67mm x 10mm.